WASHINGTON: The Fix the Debt organization has brought together the CEOs of more than 80 US corporations, such as Delta Airlines, Goldman Sachs, and Microsoft, to urge Congress to pass legislation to reduce the federal deficit. Campaign organizers have raised more than $30 million to boost awareness. Promotional efforts include social and traditional media outreach, grassroots mobilization, and a paid media component. DCI Group, Glover Park Group, and Dewey Square Group are supporting the campaign. The chief communicator behind the initiative is Jon Romano, who left his post as communications director for North Carolina Gov. Bev Perdue last month to become VP of communications for the group. Erskine Bowles, a former chief of staff for President Bill Clinton, and former Sen. Alan Simpson (R-WY) founded Fix the Debt. Simpson and Bowles co-chaired the National Commission on Fiscal Responsibility and Reform, created by President Barack Obama in February 2010, to address the US debt situation. The business leaders represent companies that employ more than 6 million people. 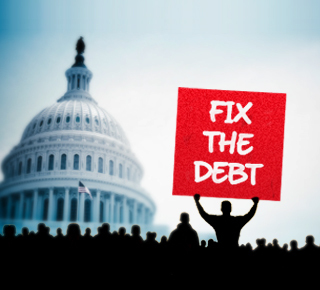 More than 280,000 American citizens have signed the Fix the Debt petition. The campaign will continue past the election until a federal budget bill is passed, Romano said. Moving forward, Fix the Debt hopes to establish state chapters that will oversee town halls and roundtable meetings on debt issues, he said. Earlier this year, the State Budget Crisis Task Force hired Widmeyer Communications to promote a report on financial problems faced by US states.